Uncommon presentation of Texas and highlighting of the California Gold Region. Vereinigte Staaten von Nord-America: Californien, Texas und die Territorien New Mexico u. Utah. 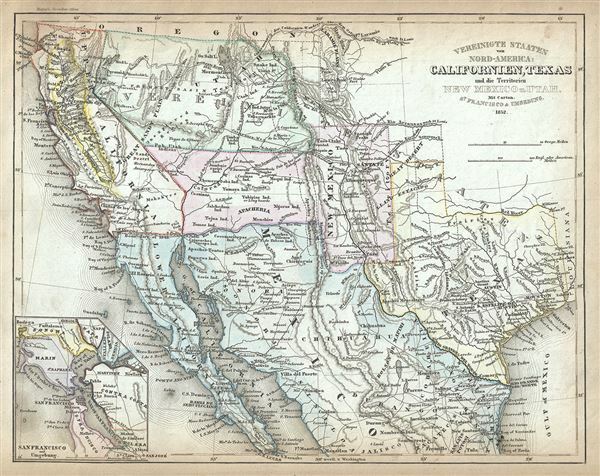 This is an uncommon and appealing 1852 map of the American southwest by Joseph Meyer. The map covers the greater southwest from the 42nd parallel south to include all of modern day California, Utah, Nevada, Arizona, New Mexico, Texas, Colorado, and northern Mexico. The routes of explorers as well as various emigrant routes are noted, including Fremont's Route and the Great Wagon Road (Caravanenweg der Californien-Wanderer aus dem Ostein). Salt Lake City is identified as Mormon City and is erroneously placed on the western shores of Great Salt Lake. The term 'Apacheria' appears in modern day Arizona, referring to the area inhabited by the Apache Indians. The map also identifies several other Indian tribes, settlements, and towns, along with various topographic features. An inset map of San Francisco is included in the lower left quadrant. This map was made shortly following the Mexican American War (1846-1848) and the Treaty of Guadalupe Hidalgo. The 1848 treaty, which formally ended the war, annexed all Mexican territory north of the Gila and Rio Grande Rivers, including the short lived Republic of Texas, to the United States, increasing the country's size by about 35%. Texas is here shown in a most unusual incarnation, extending north as far as the 27th parallel but terminating on the west at the 26th degree of Longitude. This map also shows the Mexico – U.S. Boundary line prior to the Gadsden Purchase. The southern border of New Mexico (and modern day Arizona), this terminates at the Gila River. Though primary intended for the construction of a transcontinental railroad along a deep southern route, the Gadsden Purchase also aimed to reconcile outstanding border issues between the US and Mexico following the Treaty of Guadalupe Hidalgo, which ended the Mexican-American War of 1846–48. Apparently these issues revolved around an error in the map utilized in the Treaty (an 1847 edition of John Disturnell's Mapa de los Estados Unidos de Mejico) which perpetuated an error initially made by H.S. Tanner in the second edition of his 1826 Map of Mexico. As a consequence, a critical region lying south of the Gila River, which was intended to be part of the United States, was still a part of Mexico. Also of interest is Meyer's presentation of the California gold region - here highlighted in bright yellow. Three years before this map was drawn the California gold discovery of 1849 enticed thousands to embark upon the rigorous transcontinental emigration. Although by 1852 most American maps no longer highlighted the gold region, Meyer is once again catering to his primarily Germanic audience by presenting the American west as a land of wealth and opportunity. This map was issued as part of Meyer's Groschen Atlas. It was most likely drawn by Jospeh Grassl, as were previous variants of this map presented in earlier editions of the Groschen Atlas, but the Grassl imprint has here been removed, suggesting that the plates were updated and revised by another unknown mapmaker. There are several variants on this map, mostly relating to the political evolution of the Texas-New Mexico region. Despite all examples being dated 1852, we have identified at least three variants. This being the second. Wheat identifies this map as '1852 German,' citing its obscure origins; however we have identified the cartographer as Meyer/Grassl. Meyer, J., Meyer's Zeitung Atlas, 1852. Wheat, Carl Irving, Mapping the Transmississippi West, 1540-1861 (5 vols), #750.